Four calves start off running from 30 kids in one of the early Kiddie Calf Scramble events, July 29 at the Greene County Fair. Contestants had to be among the first four contestants to grab an adhesive tag off the backs of the cows to win anywhere from $20 for first place to $5 for fourth. Devan Lapchynski tries to coax his calf into the center circle during the annual Greene County Fair Calf Scramble, July 29 in Xenia. Lapchynski, 15 of Xenia, was eventually able to succeed in bringing the cow in. 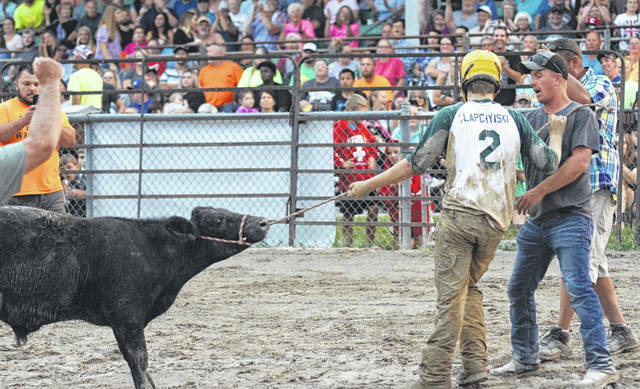 A calf scramble contestant fights to keep his calf harnessed, during the July 29 Calf Scramble at the Greene County Fair. In a battle of patience, will, mud and fortitude, a Calf Scramble contestant does his best to wait out a stubborn calf’s fight, during the annual competition July 29 at the Greene County Fair. Calf Scramble contestants not only had to capture the calves and get them under their control, they also had to attach a rope harness around the cow’s head and then pull the large animal through the mud into a center circle in order to claim their animal. Here a contestant struggles with attaching the harness, July 29 at the Greene County Fair. XENIA — As soon as the five calves were released from their pen at the far end of the pen, July 29 during the annual Greene County Fair Calf Scramble, Wesley Wickline sort of had an eye for the one he was going to try and go after. There were four dark brown steer and one blonde in the pen. Wickline was the first of five Calf Scramble contestants to tackle a calf, properly harness the animal, and then pull the beast until all four of its legs were completely inside a center circle painted onto the Chip Noble Memorial Track frontstretch. He tackled, harnessed and tugged the blonde steer to the circle in the contest’s first four minutes of competition. Tyler Morris, 17 of Spring Valley, nabbed the second steer almost five minutes later. By the time the event was finished, the Number 8 on the back of Morris’s jersey was caked in mud and definitely unreadable. Marshall Oberschlake, 14, of Fairborn should earn a prize for coolest fan T-shirts as well. About 30 or so family and friends wore bright pink T-shirts with the message “Marshall, catch that Moo!” on the backs of them. Other Calf Scramble winners, in order of their finish, were Logan Cherpeski, 14, of Fairborn, and Devan LapChynski, 15, of Xenia. The nearly packed grandstand and infield area erupted in a cheer as four girls claimed all the prizes in the Kiddie Calf Scramble for 8 and 9 year olds. Gracie Barron, Lola Smith, Charity Dunn and Rylee Queary claimed respective prizes of $20 dollars, $15, $10 and $5. Girl Power continued to reign in the 9-10 year olds event as Chloe Trimbach claimed first prize followed by the first boys winner, Trevor Moore, with third-place female Madelin Reater and fourth-place female Tierra Wade. In the 10-11 year olds competition. Tayla Greene claimed first prize, followed by Alex Horney, Ella Stillings and Jacob Lide. It wasn’t until the final 11-12-13 year olds scramble that an all-boys finish took place. Gunnar Gannon won the event, then returned to his perch in the Chip Noble track infield to once again wear his sash as the County Fair Prince! Gavin Dailey placed second, Corey Childers was third and James Dray fourth. Ben Lucas deserves mention in the 11-12-13 competition. At one point, he had grabbed the final tag off a cow’s back only to be driven into the iron fencing by the same cow. Lucas dropped the tag, but earned a sore shoulder for his efforts. The pen area for the Calf Scramble was watered down, thanks to Xenia-based A&L Water Hauling. By the time the driver had unloaded his tank of water, the Chip Noble Memorial Track’s frontstretch was a perfectly sloppy sea of mud for the final competition. 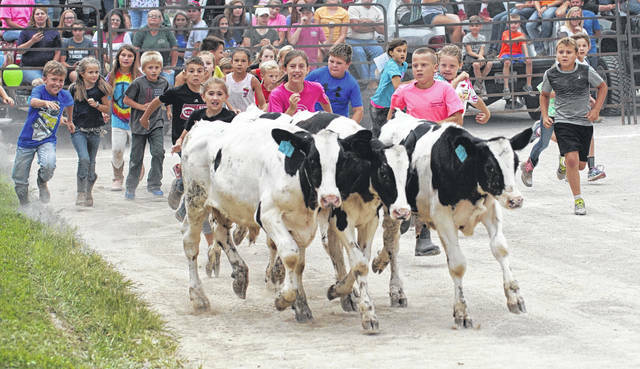 https://www.beavercreeknewscurrent.com/wp-content/uploads/sites/49/2018/08/web1_Kiddie01.jpgFour calves start off running from 30 kids in one of the early Kiddie Calf Scramble events, July 29 at the Greene County Fair. Contestants had to be among the first four contestants to grab an adhesive tag off the backs of the cows to win anywhere from $20 for first place to $5 for fourth. https://www.beavercreeknewscurrent.com/wp-content/uploads/sites/49/2018/08/web1_scramsports01.jpgDevan Lapchynski tries to coax his calf into the center circle during the annual Greene County Fair Calf Scramble, July 29 in Xenia. Lapchynski, 15 of Xenia, was eventually able to succeed in bringing the cow in. 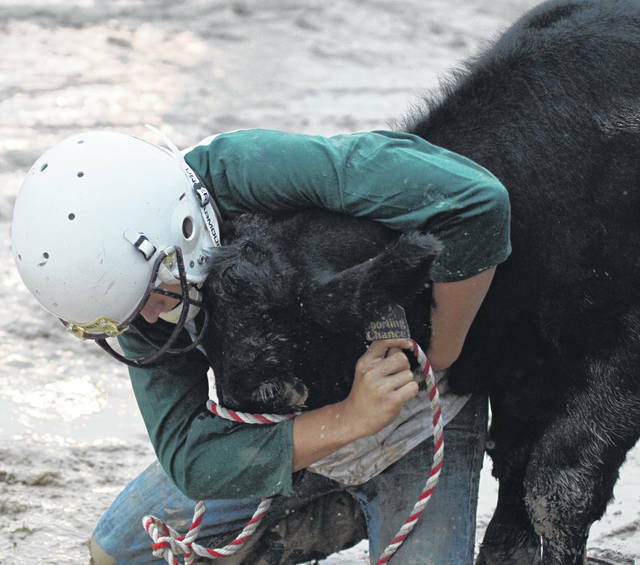 https://www.beavercreeknewscurrent.com/wp-content/uploads/sites/49/2018/08/web1_scramsports02.jpgA calf scramble contestant fights to keep his calf harnessed, during the July 29 Calf Scramble at the Greene County Fair. 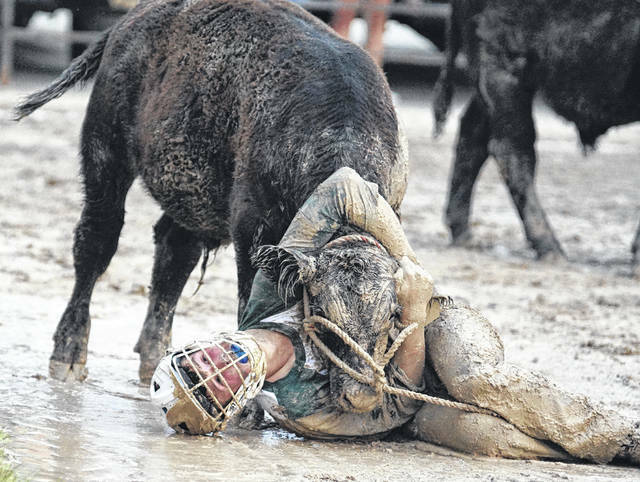 https://www.beavercreeknewscurrent.com/wp-content/uploads/sites/49/2018/08/web1_scramsports03.jpgIn a battle of patience, will, mud and fortitude, a Calf Scramble contestant does his best to wait out a stubborn calf’s fight, during the annual competition July 29 at the Greene County Fair. 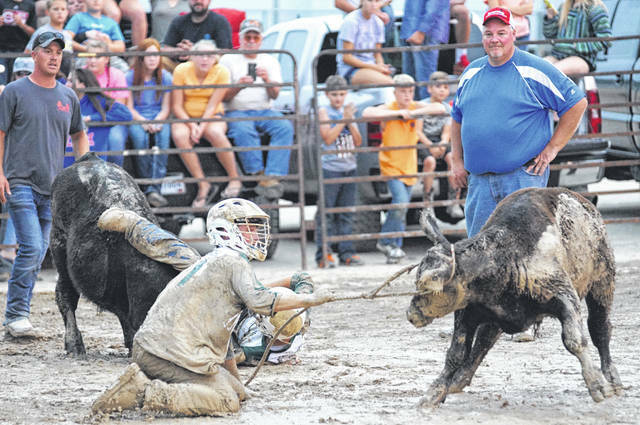 https://www.beavercreeknewscurrent.com/wp-content/uploads/sites/49/2018/08/web1_scramsports04.jpgCalf Scramble contestants not only had to capture the calves and get them under their control, they also had to attach a rope harness around the cow’s head and then pull the large animal through the mud into a center circle in order to claim their animal. Here a contestant struggles with attaching the harness, July 29 at the Greene County Fair.